Good Morning, my DIY Stencil friends! Now do you prefer a grand HELLO or a sweet whispering hi? Cutting Edge Stencils is here to say there are many ways to make a statement. Some of us prefer big, bold, grandiose, smack you in the face sort of statements while others prefer small, subtle, tap on the shoulder sort of statements. And the truth is there really isn’t a right or wrong here. The same thing is true for stencil design. There are so many ways that you can use color to enhance your stencil design in your space. Depending on your color choices you can take a very intricate pattern and give it a very soft and muted affect. At the same time, if you choose high contrasting colors for the same intricate stencil, your wall can make a bold statement. Hey, are you not believing us? Well you will after your read today’s Stencil Stories! Let’s take a look at one of our popular Moroccan patterns, the very intricate Trellis Allover Stencil! Now keep in mind the Trellis Allover Stencil is a beautiful Moroccan stencil design. 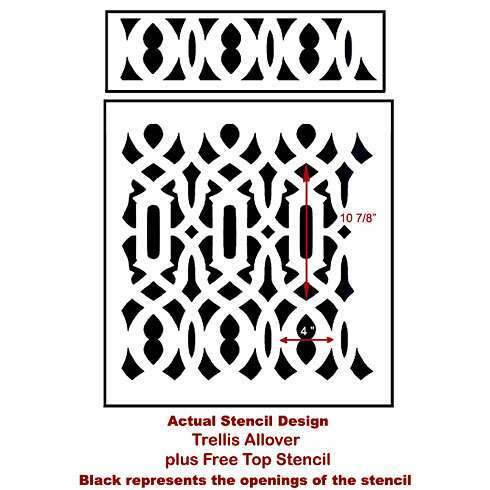 This popular trellis design will look stunning on in just about any space and the best part about this particular stencil is how easy it is to use. It’s been rated ‘beginner’ because it’s one of the easiest stencils to use. So all my first time stencilers listen up; you should have no fear when it comes to choosing the Trellis pattern! Stencil Bold in Your Home! Let me introduce you to NataLee, our crafty designer friend behind the blog, Designed to the Nines. NataLee had been lusting after Trellis patterned designer drapes. Of course, the hefty price tag was a complete turn-off and for awhile it seemed as if she would never have that bit of Trellis design in her home. 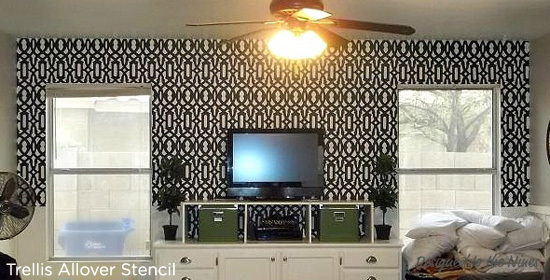 That was until she discovered our reusable Trellis Allover Stencil for $39.95. It was as if her Trellis dreams were coming true but now instead of just a pair of drapes, NataLee could stencil an entire accent wall. She totally embraces bold colors and chose a rich chocolate brown and white. The huge contrast between the two hues really packs a punch with this design. NataLee says, “I totally realize this might be a little too high contrast for some people. But I love how it turned out! I smile every time I re-enter the room.” We’d smile too, how about you? Making a Subtle Stencil Difference! Now meet Jenna, who is the creative designer behind the blog, SAS Interiors. 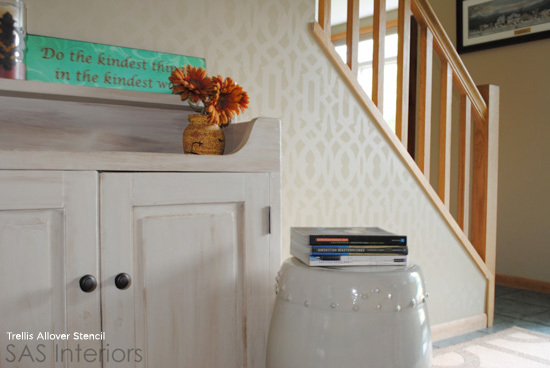 Jenna wanted to spruce up the wall in her foyer which was painted Benjamin Moore’s lenox tan HC-44. With the Trellis Allover Stencil in hand she decided to give it a go! Instead of choosing two contrasting colors, Jenna decided to play with the different sheens. Since her base wall was painted in a flat paint, she decided to stencil in a high gloss version of lenox tan. She said, “My thought was this contrast of sheen would give a subtle, but dramatic appearance (and it does)!” WE have to agree, it really does!! See how stunning this pattern can be even in with just a subtle sheen change? So tell us which you prefer: the bold version of the Trellis Allover or the more subtle tone-on-tone version? Shop our stencil designs and find the perfect one for your space! Are You Passionate About the Paisley Stencil?